HMS Malaya was a Queen Elizabeth-class battleship of the British Royal Navy, built by Sir W. G. Armstrong Whitworth and Company at High Walker and launched in March 1915. She was named in honour of the Federated Malay States in British Malaya, whose government paid for her construction. 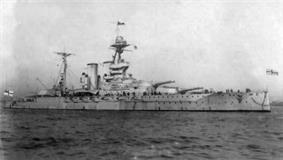 Unlike her sisters Queen Elizabeth, Warspite and Valiant, Malaya did not undergo a significant rebuilding between the wars. In World War I, she served in Admiral Hugh Evan-Thomas's 5th Battle Squadron of the Grand Fleet. She took part in the Battle of Jutland, 31 May 1916, where she was hit eight times and took major damage and heavy crew casualties. A total of 65 men died, in the battle or later of their injuries. Among the wounded was Able Seaman Willie Vicarage, notable as one of the first men to receive facial reconstruction using plastic surgery and the first to receive radical reconstruction via the "tubed pedicule" technique pioneered by Sir Harold Gillies. Uniquely among the ships at the battle, HMS Malaya flew the red-white-black-yellow ensign of the Federated Malay States. On 17 November 1922 Malaya carried the last Sultan of the Ottoman Empire, Mehmed VI, from Istanbul into exile on Malta (and later San Remo). In August–September 1938 she served in the port of Haifa during the 1936–39 Arab revolt in Palestine. 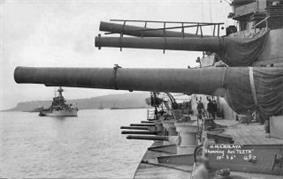 Unlike her sisters Queen Elizabeth, Warspite and Valiant, Malaya did not undergo a significant rebuilding between the wars. She did receive a Le Cheminant deck watch from the Royal Observatory on 5 April 1933. 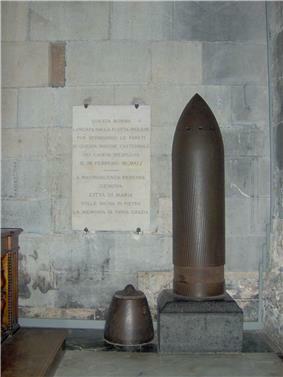 Armour piercing shell - with cap (left) fired on 9 February 1941 in the nave of Genoa cathedral. In World War II she served in the Mediterranean in 1940, escorting convoys and operating against the Italian fleet. On one occasion her presence in a convoy was sufficiently discouraging to the German commerce raiders Scharnhorst and Gneisenau that they withdrew rather than risk damage in an attack. She shelled Genoa in February 1941 as part of Operation Grog but due to a crew error, fired a 15" armour piercing shell into the south east corner of the Cathedral nave. The fuse failed to detonate. She was damaged by a torpedo from U-106 at 2323 on 20 March 1941. U-106 attacked the shadow of a merchant ship with a spread of two stern torpedoes in bad light from the port side of the Convoy SL 68 about 250 miles west-northwest of the Cape Verde Islands. Kapitänleutnant Jürgen Oesten heard hits after 2 minutes 37 seconds and 3 minutes 35 seconds. One torpedo damaged Malaya and the other the Meerkerk. Malaya was hit by the torpedo on the port side, causing considerable damage. Due to the flooding of some compartments the ship took a list of 7 degrees, but safely reached Trinidad. After temporary repairs were made, she continued to the New York Navy Yard, where she was docked for four months. On 9 July, under the command of Captain Cuthbert Coppinger, the battleship left New York on trials and steamed to Halifax, Nova Scotia to provide protection for an urgent fast convoy. On this Atlantic crossing no ships were lost and Malaya arrived on 28 July in Rosyth. Thereafter Malaya escorted convoys from the United Kingdom to Malta and Cape Town until summer 1943. Malaya was placed in reserve at the end of 1943. During this time her entire secondary 6" armament was landed while her anti-aircraft armament was enhanced. Between 15 and 17 May 1944, Malaya was used in Loch Striven as a target ship for inert bouncing bomb prototypes, one of which punched a hole in the ship's side. She was reactivated just before the Normandy Landings to act as a reserve bombardment battleship. Malaya was finally withdrawn from all service at the end of 1944 and became an accommodation ship for a torpedo school. Sold on 20 February 1948 to Metal Industries, she arrived at Faslane on 12 April 1948 for scrapping. The ship's bell can be seen in the East India Club, London. ^ Fisher, David (2009). "Plastic Fantastic". New Zealand Listener. Retrieved 23 September 2009. ^ The Royal Navy and the Palestine Patrol By Ninian Stewart. Routledge. 2002. Retrieved 16 June 2011. ^ "Obituary:Commander Henry Hatfield". Daily Telegraph. 4 July 2010. Retrieved 5 July 2010. ^ Flower, Stephen (2002). A Hell of a Bomb: The Bombs of Barnes Wallis and How They Won the War. NPI Media Group. p. 320. ^ Ballantyne, Iain (2001). Warspite warships of the royal navy. Pen & sword books Ltd. p. 215.